With his tribute at Bell Centre he was somewhat emotional & his last comment was "Enjoy the Playoffs" as a slam to his employers? An Icon in sports broadcasting & 1 more game somewhere down the road would be great. Looking back, I commented on those posts 9, 8, and 6 years ago wholeheartedly agreeing with your sentiments. So let me add my voice to the chorus one more time. I don't think I'm ever going to enjoy listening to an announcer more than I do Cole. He's the only announcer in any sport where I'd watch a game I otherwise wouldn't be interested in just to hear the play-by-play. Cole's great not as much for what he says than how he says it: I've never heard anyone else with the skill to carry their voice in perfect rhythm with the game quite like he does. Listening to him call a game almost has a musical quality to it. He has a gifted voice and sense of timing, which has fortunately been a gift to all of Canada for half a century. My god, to say he's the best in the business feels like an understatement. "Auston Matthews carries the puck through the neutral zone, he drops it back for Rielly, A SHOT ON GOAL! Look out! And the. Montreal Canadiens. Clear the rebound out and down the ice." "Look at Nylander, skating beautifully with the puck, passes it off to Kadri. Kadri shoots it down low, the save made. Marleau with the rebound! And a dandy save by Lindgren. WOW. Things are really heating up now, folks. During this 1-1 hockey game." Just reading that in his voice makes me miss him already. What an icon. If I were TSN I would hire Bob to call some of their regional broadcasts, not that I don't enjoy Gord Miller but Bob Is Iconic with his call of the game. I wish you did an episode about the weirdness of the last few years of Bob Cole's career. He clearly made some enemies in high places because his trajectory makes no sense with the constant starting and stopping of his career. I can't imagine someone like Al Michaels, Marv Albert, Jim Nantz or any other legendary American sports broadcaster being treated like Bob Cole has been treated by our broadcasters up here. It's kind of embarrassing considering what his calls have meant to the NHL over the last half century. I like the guy too, but I enjoyed Danny Gallivan more. Listen, everyone needs to retire sooner or later, and you may as well retire before your mistakes overwhelm your legacy. Bob's at that point. Let someone younger have a chance. While I respect my elders, there's a time to clear out and let the younger generation have a chance. Having grown up in Montreal I cut my teeth in the 70's listening to Danny Gallivan, and like Fakeologist, enjoyed him more. Having said that, I was a Habs fan, so may have been naturally biased since he covered my teams games, and that takes nothing away from my appreciation of Bob Cole, who has always been a master of his craft. You can never have enough Hall of Fame type broadcasters for our national game, so best to appreciate their greatness and be thankful that we had the opportunity to listen to their calls. Bob Cole was a fixture of my childhood. He called games that I watched with my grandparents, with my parents, with my friends. He called games for terrible Leaf teams and made them feel like they meant something. He called huge playoff games for good Leaf teams and made them feel like they meant even more. I still get goosebumps when I listen to his call of Wendel's hat trick goal against LA in 93, in the dying moments of game 6 to tie the game. My favourite might be his call of Brad Smith's goal in the game 6 clincher of the 87 playoffs against the Blues. I've been looking for it for a long time and found it here - https://youtu.be/0I8bDUMix54?t=390 (let it run for a few seconds, there's a great clip of Ken Wregget playing without a helmet just before the goal). He elevated dramatic moments, and was never over the top or corny. He was the best I've ever heard. I think, unfortunately, that it's his time to go. I wish that it weren't, that he could call games for the rest of his life. It would have been nice if he could have gone out on his terms, but at least he got to finish out the season. The original plan of him finishing before Christmas seemed a bit cold. It's sad to see the people we admire move on. He had a great send off, and I hope that he can find peace and enjoyment in his retirement. 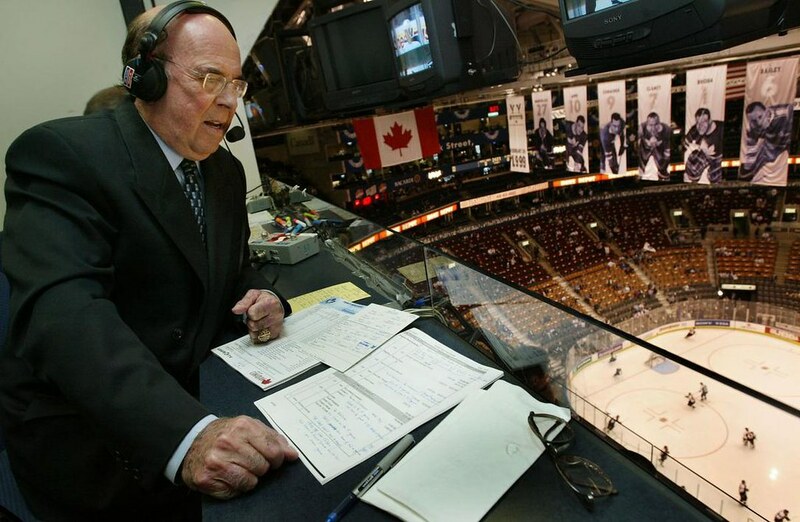 There will never be another Bob Cole. 'Bob Cole' was on Sauga960 this morning, mentioning "Detroy-it", "San Louis", etc. Can’t for the life of me understand what people are talking about. Cole has been hot garbage to listen to the past 5-10 years. He can barely string a sentence together let alone call a play right with any sort of consistency. His mind is clearly too slow how to keep pace with the game and he should have retired gracefully years ago. It’s embarrasing seeing him being dragged out and propped up just for “nostalgia” sake. You had a good run Bobby, but it went of cliff far too long ago to matter. Though I grew up with the Hewitts and Gallivan I felt that Bob Cole was right up there with them. I don't care how old he is. I'd take him any day over Joe "scream your head off" Bowen.